The Baltimore food community will deeply miss one of its most passionate members, Joyce Smith, who died recently of heart failure at Johns Hopkins Hospital at the age of 66. 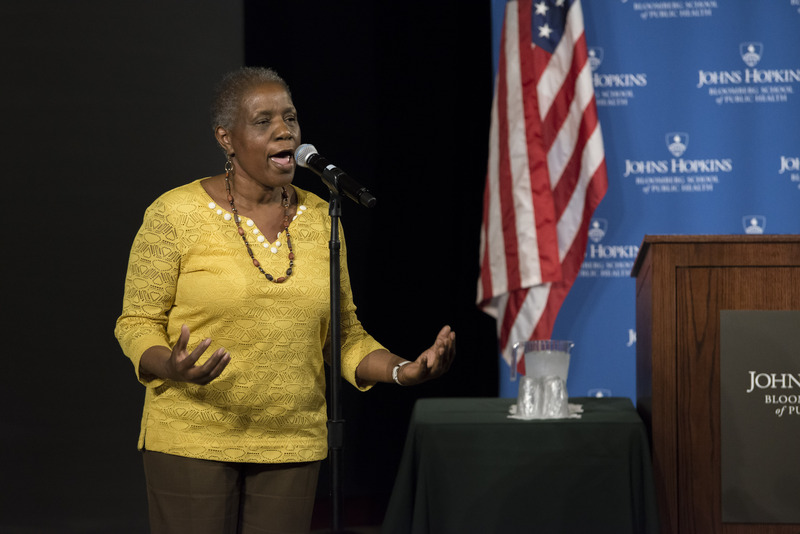 She was known and loved by the Johns Hopkins Center for a Livable Future (CLF) for all of her work on behalf of her community, and toward making food systems healthier, more resilient and more equitable. In her role as a community relations coordinator at the CLF, she connected researchers and food system reform advocates to her community through Operation ReachOut SouthWest (OROSW), which she helped to found. 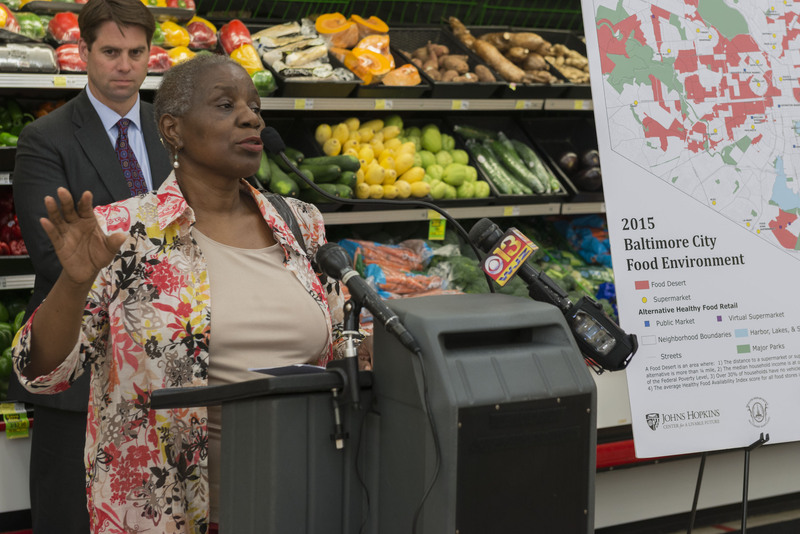 As part of OROSW’s strategic plan, the CLF partnered with Joyce to conduct the first community food assessment in Baltimore. As a leader in that organization, she helped to educate her community about the importance of diet and exercise in disease prevention. Joyce was a familiar face at community events (such as this back-to-school event where she introduced children to “ants on a log”) and could often be found offering samples of healthy snacks or giving advice about how to cook nutritious foods in delicious ways. An avid gardener, she was involved in community gardens and often sold produce at affordable prices from those sites or nearby locations. Joyce was immensely helpful to researchers at the CLF through her work with Community Food Assessments, which surveyed people in Baltimore about the availability of food in their neighborhoods and explored food security in those neighborhoods. She trained many community members on how to conduct a survey for the community food assessments throughout many Baltimore neighborhoods. 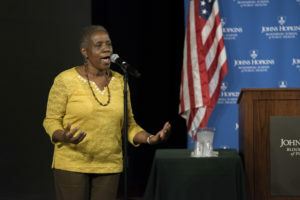 During the Center’s 2016 Polly Walker Ecology Fund event, Joyce charmed the audience with stories ranging from topics such as the arabbers who sold produce from horse-drawn carts in her childhood neighborhood to selling produce on the corners of Southwest Baltimore. In her life, Joyce not only talked the talk but also walked the walk. She changed her lifestyle to be more healthy, “divorcing” herself from sugar-sweetened soda, with which she joked to have a “longer relationship than any man.” All her community events featured healthy options; kale salads, fruit bowls and water. Long before urban agriculture became popular, she started the OROSW garden and grew food in her small backyard in the middle of her community. And she is perhaps most cherished for her personal interest in the health and healthy habits of those she knew and loved. Here are a few remembrances from those who knew and worked with her. I first worked with Joyce in 2007 when she participated in the School’s Mid-Atlantic Health Leadership Institute. She immediately impressed me as a person with a true sense of purpose. To me, that sense of purpose—combined with wonderfully creative problem-solving skills and a special gift for connecting with people—was part of what made Joyce such a unique person. Over the years, I came to admire Joyce for her generous spirit, and for the way she always made the time to talk and connect. Her natural way with people was inspiring and served as a reminder to all of us to take the time and to appreciate our common humanity. What If Every American Understood the Farm Bill? 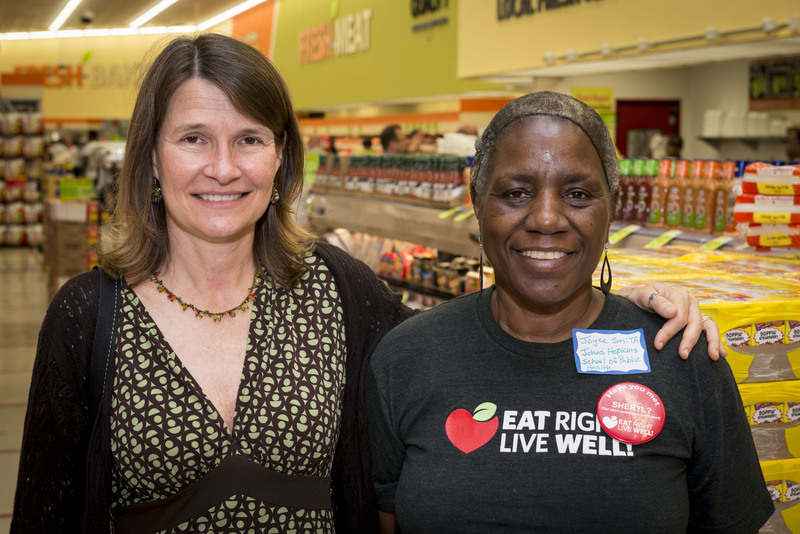 Christine joined the CLF in 2011 and writes about food system thinking—the intersection of food systems and public health.